SLIPKNOT and STONE SOUR frontman Corey Taylor joined FOZZY on stage during Chris Jericho's Rock 'N' Wrestling Rager At Sea to perform covers of KISS's "Cold Gin" and THE KINKS' "You Really Got Me". Video footage of his appearance can be seen below (courtesy of Metal Injection). Chris Jericho's Rock 'N' Wrestling Rager At Sea, launched in partnership with Sixthman, the industry leaders in festivals at sea, delivered a breakthrough vacation experience aboard the Norwegian Jade. 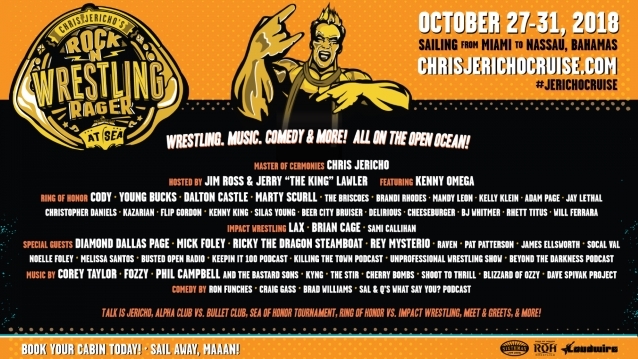 The FOZZY singer, six-time WWE champion and over 2,000 die-hard friends of Jericho set sail October 27-31, from Miami to Nassau, Bahamas, joined by some of Y2J's closest musician, comedian and wrestling hall of fame friends. 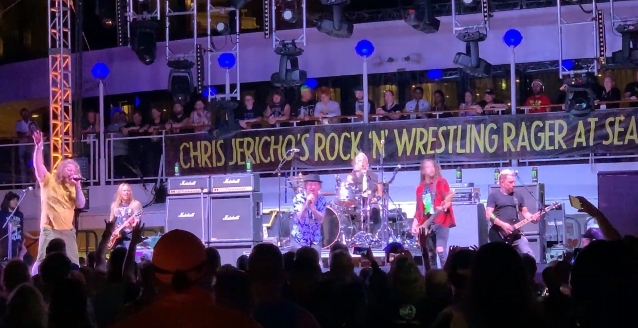 Earlier this year, Chris stated about Chris Jericho's Rock 'N' Wrestling Rager At Sea: "The moment I walked off the 'Kiss Kruise' after playing it with FOZZY in 2015, I called my manager with the idea doing a rock and wrestling cruise. My thoughts were that it would feature everything that Chris Jericho is known for: wrestling, rock and roll, podcasting, comedy, paranormal discussion and most importantly, A GREAT PARTY! Throw in as much food and drink you can handle, a beautiful island paradise like the Bahamas and you've got everything you need for the greatest destination vacation that a rock and wrestling fan could ever dream of!"